Readers will of course draw their own conclusions. 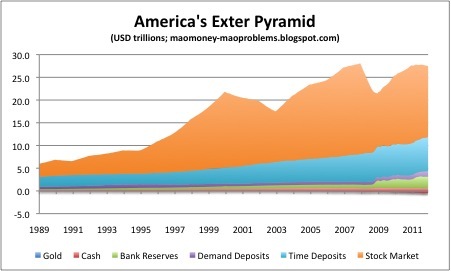 My main conclusion is that America’s monetary system is a batshit-insane securitisation-fuelled bloated head and shoulders top, and that China’s is far more sustainable because it is driven by savings and not by speculation and securitisation. But I think most of us already had a hunch of that. 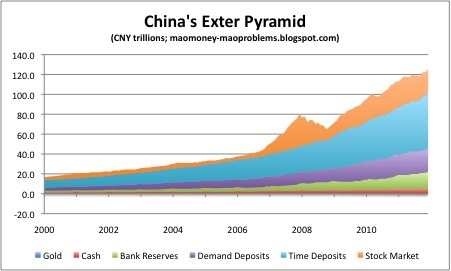 This entry was posted in Economics, International Relations and tagged america, china, exter pyramid, leverage, mao money mao problems, securitisation, stock market, stock market bubble, toxic derivatives. Bookmark the permalink. I hate to be combative, but the USA is a place where Equity can be raised to fund long term assets and innovation. For example the company http://www.westport.com/ is a game changer for world transportation. It converts an abundant energy source (Natural Gas) that is very cheap by cost recovery to energy output, into transportation motion. The USA is a great place to live if you have the money. Where else can you drive to world class ski, beach forrest and entertaionment? This attracts the best and brightest. The innovators. And with restrictions on Green cards for the wealthy, you’ll see increased immigration from the developing world. This will underpin their housing stock and their dollar. They will repay Government Debt and their will be a focus on bureaucratic waste withe increased use of combative bloggs. I am positive we are just in a little rut. I agree we have a right shoulder top, but something tells me we’ll see a productivity breakout due to innovations like Westport. I am not totally bearish on America. I too think there are some prospects for an American recovery. But most of the fundamentals are still negative.